"MANY PEOPLE ASK HOW I BECAME SO SUCCESSFUL IN BUSINESS, BUT THE TRUTH IS, IT CAME AT A HUGE COST"
Sometimes I am asked to speak in public about my work, my goals, and my perspectives on the future of our industry. I have spoken in front of my peers and competitors, the broader business community, and young people who are just starting out in the industry. They all have a collective desire to achieve notoriety, wealth and influence. In every case, they all just want to know one thing: How did I become successful? The truth is, I don’t think that I am particularly successful. Certainly I have achieved what society accepts as a very narrow definition of success, having reached a high level of professional and financial accomplishment. But at what cost? Growing up in a highly academic family, there was great emphasis placed on achieving academic success – my family’s assessment of one’s value largely correlated with their academic accomplishments and its disguise as intelligence. Unfortunately for me at the time, I was not a very academic student. By contrast, my sibling excelled spectacularly in the classroom. My father was frustrated by this disparity between us, and perhaps even in shock that he had produced two children so diametrically opposed. My academic shortcomings irked him. Because I wasn’t naturally fitted to the academic process of the schooling system, I was viewed as offering less value to the world. Every kid knows what this is like. I yearned for acceptance. I yearned to be truly seen and to be valued. I did whatever I could to receive validation from my father, to fit the mould he expected of me. Ultimately I learned how to tap into the deep current of shame and inadequacy I felt, and swam in another direction entirely. I was determined to show that, despite the embarrassment I caused to my father, my lack of academic achievement would not be a barrier to my success. And I would use my success to fulfil my own passions and desires. I went on boldly, using the negative feelings of inadequacy as my driver, as my motivator and sought recognition from the business world. Eventually, I started to notice the material rewards, which became an early barometer to measure this elusive thing people call ‘success’. It became highly addictive. Being motivated toward success by shame and pain, however, is not a happy place to be. The energy I was able to draw from such a place was limitless, however being addicted to such a narrow definition of success never allowed me to realise true contentment. Being motivated by pain, which was my greatest motivator, may have created great success in one or two facets of my life. 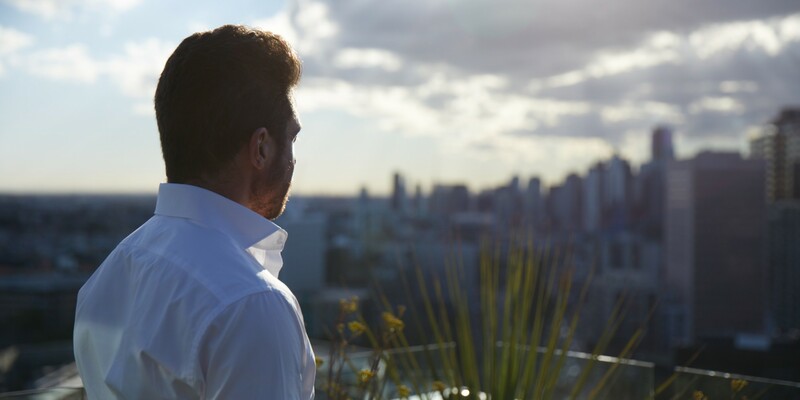 I can now look back on my early so-called ‘success’ – the notoriety, the financial reward – and realise that I actually was not a successful person at all. I was not successful in my relationships, or in my physical or emotional health. I was consumed by one vacuous version of success, and the cost was being unsuccessful in many other areas of my life. Often people who didn’t personally know me would tell me that they were intimidated by my success. Deep down, I often felt intimidated by their success, for it represented something that I had missed out on in my journey to professional achievement. I hadn’t really lived a well-rounded, experienced life like many of my peers had. I had missed out on many lessons and joys that life has to offer. I had lived a very insulated life, and wasn’t particularly accomplished in a broader sense beyond monetary accumulation. Through travel, my business coach, my therapist, and by adopting a less judgmental open mindset, I’ve been able to grow and evolve myself. I still don’t call myself a success, at least not yet. But I know that I am on the road to achieving it, because I’m now no longer motivated by pain, but rather, by joy. I’m open to reward, to serendipity, to true connection, and fulfilment. You cannot possibly succeed in everything. Any version of success, including my own, has to be okay with losing out on something. The challenge is deciding what is worth compromising. Even in the business world, these compromises can set us back tremendously, losing out on valuable lessons and human connection. I believe it is human connection that gives the greatest reward in this life. These days I’m determined to really live life, to succeed in a variety of ways – to travel more, to meet open minded people rich in life experience. To move BPM forward from a place of happiness, not anxiety or stress or pain. I’m incredibly excited to see what true success is now in store for us – in business, health, and relationships – but by taking a vastly different road to my destination. I encourage you to also reframe what your version of success looks like, with a word of caution as you embark on your chosen path: Proceed tentatively about how much life experience you are willing to sacrifice in its pursuit. For those priceless, invaluable experiences may be the very determinants of your greatest life accomplishments.